Christmas Made Easy with TShirt Print Online! Here at TShirt Print Online, we’re taking the hassle out of Christmas shopping for you by making gift making as easy as possible – and nothing says you care about someone special more than a personalised gift! With our online designer, you can create a TShirt design from scratch – or use our editable designs to whip up something fast. Choose from our wide selection of garments to print on and with our super-quick turnaround, you’ll have your order within days! So don’t sweat the small stuff this festive season, with personalised gifts! We have a special ‘Christmas’ section on the website dedicated to helping our customers make the most out of our products and designs. Browse our range of Christmas stockings, sacks and toddler’s hats, click on the one you like and with our powerful online designer, you can immediately change the name, click apply and see exactly how it will look once we print it for you! You no longer need to worry about how it will look with the personalisation of your choice on there because you see it straight away! Not only that, but our range is timeless and classically Christmas, meaning that the personalised product can be used year-on-year for many Christmases to come! 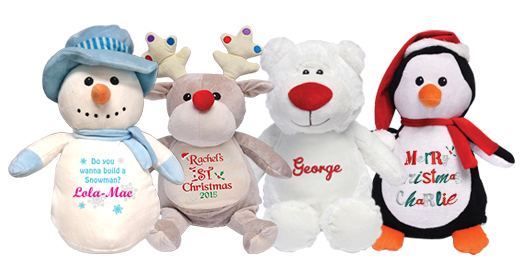 Our other Christmas specific products include embroidered cuddly toys and a baby’s first Christmas set – All of which are easy to personalise – Perfect for young families and small children! The toys consist of super soft polar bears, penguins, reindeers and our brand new snowman, fitting for all those Frozen fans out there! All our toys are waiting for loving owner and for customisation to be added to their bellies with high quality embroidery. And the baby’s first Christmas set includes a hooded baby grow, a toddler’s santa’s hat and a small, plush stocking, all with the child’s name added to it. You’ll win brownie points by making gifts so unique and adorable that they’ll assume you’ve pulled out all the stops just for them, when really all it took was a few click of a mouse! We’ve also got a range of Christmas designs that you can add to any of our products in the ‘Personalised Christmas TShirts’ section. Click on a design, choose a garment and just add your customised text, et voila! Your specialised presents are created in second! It’s hard not to find something you love in our range. You can even create the perfect apron for everyone helping with the big feast, and with sayings like ‘We whisk you a merry Christmas with the Anderson Family!’ you can’t go wrong and are bound to crack a smile! Or why not just peruse our ‘Buy it now’ selection of designs; choose from a great range of Christmas inspired designs that are hard not to love – all you have to do is choose the size and colour of the garment and add it to your cart, and your Christmas shopping will be done in no time. Check out our ‘buy it now’ christmas designs, or easily customise our designs on a garment of your choice or our special, personalised aprons! Not looking for anything with a Christmas theme as a Christmas present this year? But want to create something unique for someone special? Just browse through our list of products and add your own saying or design to it in seconds – perfect for those who like to make a personal statement all year round! So take the hassle out of thinking of special gifts this year by creating unique presents in seconds on TShirt Print Online – And if you prefer to deal with people rather than computer screens, just give our friendly customer advice team a call on our freephone number 0800373503 – our dedicated team are ready and waiting to take your call and help you to place your order; we even help with your artwork and designs free of charge! Just another excuse to use TShirt Print for Christmas! Free Artworking Service from TShirt Print! Get 15% off this summer!